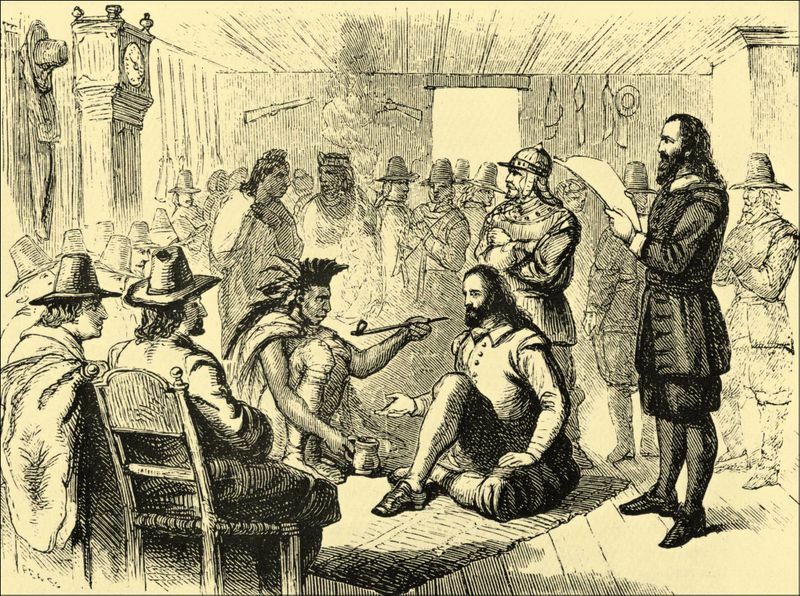 On April 1, 1621, the first peace treaty between the American colonists and the Native Americans was made in Plymouth, Massachusetts. The process began when Samoset, Squanto, and three companions paid a visit to the colonists’ tiny colony. 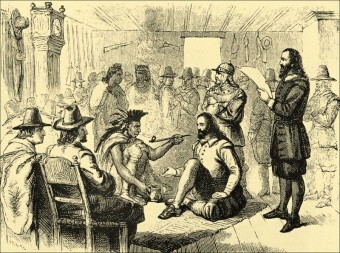 They informed the newcomers that the great Sachem Massasoit, his brother Quadequina and about 60 men were in the area. The Pilgrims would not send their governor, John Carver, to meet with them, and the Native Americans were likewise unwilling to yield to the colonists. After mutual assurances, gift-giving and finally hostage-taking, Captain Standish, William Brewster and six musketeers met Massasoit at a brook where they faced each other and saluted. With Standish and Brewster flanking each side of the Native American king, they led him into a house with several cushions on the floor. Governor Carver immediately entered the house followed by drum and trumpet and several more musketeers. The Governor kissed Massasoit’s hand and Massasoit returned the gesture, then both men sat down. Governor Carver ordered that some “strong water,” be served so he could toast the great Sachem Massasoit, who broke out in a sweat when he sampled the liquor. Massasoit was much more impressed by the Governor’s trumpets, and some of his men sounded them as best they could. That neither he [Governor Carver] nor any of his should do hurt to any of their people. That King James would esteem Massasoit as his friend and ally. Years later, it came to light that the Wampanoag wasn’t the only tribe responsible for this peace treaty, but instead there were ten other Native American tribes in the area lending their support to the alliance. The peace treaty was a great success, lasting more than five decades.